Gold Rush Day 1 is a wrap! Day 2 Tuesday! Gold Rush #1 Day 1! What a great day! After an amazing first day of play, we are through to Final Table! Congratulations to ALL 32 of our players who filled our first Gold Rush for such a great start to our new flagship Main Event. We are so happy to be hearing so much praise from you all regarding the structure and running of the event. We always strive to bring all of our players the most professional, fun, fair, and most value events possible, all of the time! Congratulations especially to our FINAL TABLE! You will enjoy the current blind level wound back to the beginning of 1000/2000 for the start of Day 2 on Tuesday May 1st @ Joondalup Sports Association. Top 4 in the money! Good luck to our Final 10! Play will resume on the WAPL Live Table, seating @ 6:45pm. Day 2 commences shortly after. 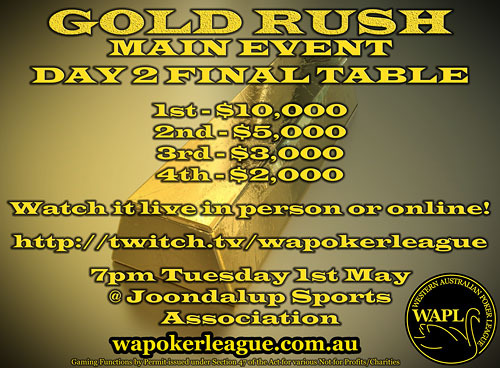 Please consider joining us from 6pm at Joondalup Sports Association on Tuesday 1st May if you'd like to rail and support your friends, or if you'd like to play in our Pro or Free League events, $5+ Flips for $700 seats in the next Gold Rush, or Cash Tables while the big final table plays!